The Z1 Analyzer software allows you to easily customize the layout to suit your style. This customization is done using the drop down menu available by right clicking on any trace. you can select what you want each of the nine traces to display by right clicking on the trace and selecting the desired option. The various data channels are arranged into various groups. Each group has a sub-menu with the various options listed. Any defined custom traces are also included in this drop down menu, allowing you to select the desired custom trace in the same fashion. You can move a trace by left clicking it title bar (located on the left side of the trace) and dragging it to the desired location. You can resize a trace by left clicking on its lower right corner and dragging it to the desired size. 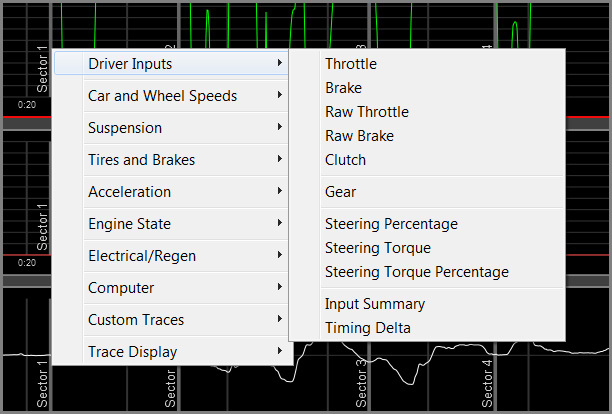 Note this also works on the Lap Data and Track Map windows. A trace can also be maximized by selecting the Maximize Trace option from the drop down. Once a trace is maximized you can select the Restore Trace option to return it to its non-maximized state. 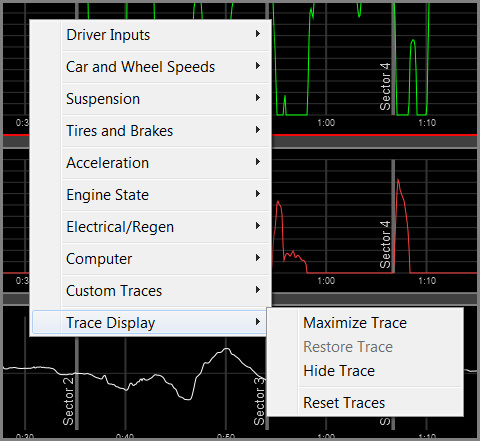 If you do not want to see or use a particular trace it can be hidden by selecting the Hide Trace option. If you want to restore all traces to their original locations and sizes then select the Reset Traces option. Note that many of these visibility options are also available under the Trace Display main menu.